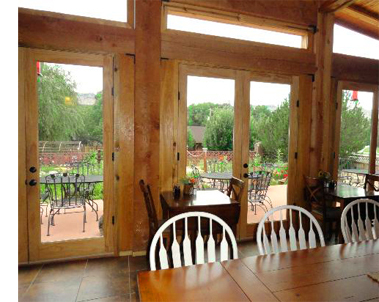 Southwestern decor, quiet and charm makes this a wonderful lodging choice between Zion and Bryce! Cabins are set along a pristine stream lined with cottonwood trees. Enjoy private cabins with log furniture and in the morning a hot, delicious breakfast is cooked for you right in your cabin! Your hosts, Terry and Audrey Behling welcome you. 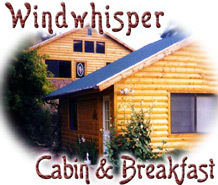 The Windwhisper Cabins are perfectly located to visit Zion National Park and Bryce Canyon National Park. Each large Best Western room has 2 Queen Beds or 1 King decorated in charming Southwestern decor and most of the rooms have hand-made log furniture. The lodge is 100% non-smoking to keep your room fresh. Each room has its own balcony or patio where smoking is permitted. 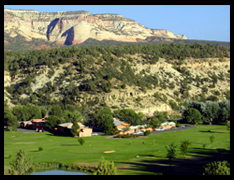 The rooms are set on a lush green golf course with mountain views in every direction. Enjoy the pool, kid's pool, hot tub, HBO, satellite TV, 27" screens, free in-room and public wireless internet, hairdryers, irons, in-room coffee, tea and golf packages. Many rooms have refrigerators and all King rooms have microwaves. Direct dial in-room phones, free local and 1-800 calls make staying in contact easier. Bringing a group? Check out the East Zion Riverside Lodge - Vacation House and Conference Room. This Bed & Breakfast, located 13 miles from Zion National Park, is bordered by white rail fences, with grazing horses in the surrounding green pastures. Deer and elk are often found in the nearby mountains, along with soaring eagles and other animals that call this valley home. Enjoy the private cabins with beautiful views of the White Cliffs. Your hosts Jim and Jane Jennings welcome you to the Arrowhead. Enjoy this charming small cabin with a small price. Well decorated and quaint with two queen beds and outside on the porch it has a hand crafted log swing to sit on and gaze at the clear night skies and the White Cliffs of the Grand Staircase. The unit has a small fridge, a microwave, a toaster, a coffee pot, heat and air. 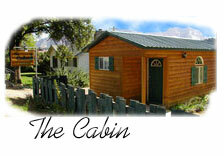 Enjoy the log cabin feel at a price that everyone can afford. Restaurants are nearby in Mt. Carmel Jct. and Glendale. Comfortable rooms at a budget price are waiting for you. 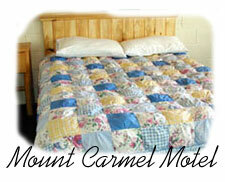 The Mount Carmel Motel offers six very clean motel rooms. Restaurants and a 9 hole Golf Course are less than 1 mile away in Mount Carmel Junction. 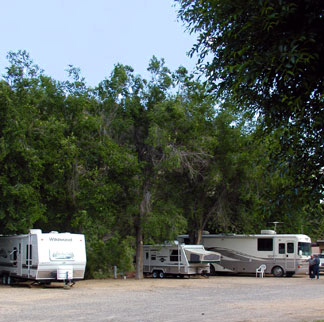 Shady cottonwood trees dot the property and the charming Muddy Creek flows behind the motel. On site post office. Located on the east side of Zion National Park on Scenic Byway 89. 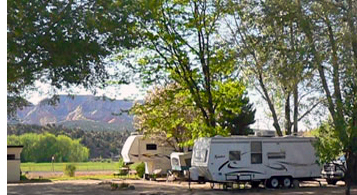 Stay in a cozy and well shaded RV park with heated pool, hot tub, on-site golf and dining. Enjoy the sound of nature and the flowing water of the East Fork of the Virgin River. Your site is right on the rivers edge. Relax in the pool and hot tub and play a round of golf. Nightly rates are $15. There are 12 spaces, no pull throughs. Ask about free green fees for extended stays.